A new website has been launched dedicated to the help save NZ’s copper landline phone network. This reliable and safe phone network is threatened by legislation the “Telecommunications (New Regulatory Framework) Amendment Bill”. The select committee in charge of the bill the Economic Development, Science and Innovation (EDSI) committee is due to report to Parliament about the bill on May 4. This link (please click on the image below) of the new website explains the advantages of maintaining the copper landline phone network. This link features a press release based on an analysis of submissions posted on the Parliamentary website that show that individuals who made submissions on the bill are overwhelmingly in favour or retaining the copper landline network. Save Our Landlines NZ also has a Facebook page that you can like and follow to get news about this important campaign. 5G is the highly touted next generation of wireless communications that is designed to give faster download speeds that what is possible with the 4G network currently available in much of NZ. Unfortunately, moving to a 5G system would entail increased exposure to wireless radiation for most New Zealanders. In fact, the initial stage of the 5G system proposed for NZ would involve a doubling of cellular phone base stations in urban areas of NZ. The second stage of a 5G system in NZ would likely be followed by installation of “small cell” units transmitting in the millimetre wave band. These “small cell” units could be placed every 250 metres in urban areas. If you think that more wireless radiation in the environment would NOT be a good thing – especially considering that most New Zealanders have acceptable access to the internet via the copper landline system, the new fibre optic networks being progressively rolled out around the country and/or the 4G system – NOW is the time to let the government know. Radio Spectrum Management of the Ministry of Business, Innovation and Employment (MBIE) and it has called for a consultation on 5G in NZ. The consultation period ends at 5 PM on Monday April 30. Below you will find a summation of some points of concern in the consultation document. If you are in agreement with one or more of these points of concern please consider taking 5 minutes to write a submission. Please use the subject line: “Preparing for 5G in NZ”. Please note that a submission becomes a public document so consider what information you include. It is best to put your name and address in the body of the email and write your submission with just your name at the top of the page and attach it to the email as a separate document. There is information below to help you write your own unique submission. If you decide to make a submission, please email through the contact form at this link http://www.stopsmartmeters.org.nz/contact-us/ to let Stop Smart Meters NZ know. Thank you. That that existing 4G cellular phone infrastructure is likely to be initially be used as a “control layer” for a planned 5G network and that this is likely to mean a doubling of cellular phone towers in urban areas of NZ. If a doubling of cell phone towers in your town or city (or your closest town or city) is something that would concern you from a health perspective* this is something that you could mention in a submission. *For example, because you or someone you know are electrosensitive or because of the research showing increased cancer rates in people living close to cellular infrastructure or another reason. If you would be concerned about the possible impact on property values in your area if more cellular phone towers are built this could be something that you could mention in a submission. That frequencies described as “millimetre wave” frequencies are being considered as part of a 5G system for NZ. According to the link below, these frequencies cannot travel more than 250 metres which means that areas where 5G uses millimetre wave frequencies will need to have millimetre wave transmitters every 250 metres or less. That a 5G system in NZ could eventually facilitate 1 million internet connections per square kilometre. If you think that one million internet connections per square kilometre is ludicrous for a country that has only about 4.5 million people and a low population density, I think most people would agree with you. The huge number of connections could be used to facilitate what has been called the Internet of Things (IoT) in which allows devices to communicate with each other. If you think that it is foolish to expose New Zealanders to the health risks of additional wireless infrastructure to facilitate appliances such as domestic fridge talking a smart meter, this is something that you could mention in a submission. If you think that if 5G is instituted in NZ, it would be better for people’s health to have only one 5G network rather than three (if Spark, Vodafone and 2 Degrees all decide to build their own 5G networks) this would be a good thing to mention in a submission. That one of the frequencies being considered as part of the 5G system (1400MHz) is already being used by the NZ Police, Chorus and the Airways Corporation. Can you imagine the expense to the taxpayer of having to replace all NZ police personal radios and vehicular radio etc. systems? On the face of it, the proposal to use a frequency needed by NZ Police as part of a 5G system is so idiotic that I am surprised it is included on the discussion document. That there are no safety standards in NZ for cellular phones!!! According to the discussion document NZ has NO safety standards for the cellular phones on the market (but allows the importation of any cellular phone that is compliant with any other countries’ regulations) shows a worrying lack of concern for New Zealanders’ health. It is especially worrying considering the research linking cellular phone use to brain tumours and the fact that according to the documentary Generations Zapped, there was NO pre-market safety testing of cellular phones prior to their introduction to the market. The Spectrum NZ discussion document does NOT suggest that NZ should do its own pre-market testing of cellular phones that are designed to be compatible with the 5G system. Cellular phones that are 4G and 5G compatible would therefore potentially expose users to potentially carcinogenic RFR microwave radiation from the 4G system PLUS millimetre waves. Based on the short wave length of millimeter waves, the main health concerns at this stage – further research is desirable – appear to be potential adverse effects on the skin and the eyes. If you think that the NZ government should commission safety testing of 5G compatible modems and smart phones and other devices prior to their being marketed in NZ this would be a good point to make in a submission. If you think that all the test data for 5G compatible phones data should be published on a publicly accessible website, this would be a good point to make in a submission. The NESTF is the “National Environnental Standard for Telecommunications Facilities”. Under this standard the allowable emissions limit for 5G infrastructure using millimetre waves (or any frequency in excess of 2 GHz to 300 GHz) is 10 million microwatts per square metre (10 w/m2). NZ has high legal exposure levels despite the fact that RFR in the microwave range is classified as a possible carcinogen (type 2B) by the World’ Health Organisation’s International Agency for Research on Cancer (IARC) and despite the fact that NZ has a high cancer rate. If NZ’s already lax limits for exposure to RFR in the microwave range are revised upwards because the system proposed for 5G would be likely to exceed the current limit, this could have negative impacts on human health. If you would oppose any increase to the allowable public exposure limit for RFR in the microwave range this would be a good point to include in a submission. What is your overall attitude to 5G? Do you think that 5G is simply unnecessary because internet access in NZ is already acceptable in most ares? Do you think that NZ should wait to see what health impacts 5G infrastructure and 5G compatible devices may have in other countries where this technology is adopted prior to rushing into adopting what is essential a technology of (at this stage) unproven safety? Do you think that the cost (to individuals, families and society) of loss of productivity due to illness and treating potential adverse health effects caused by greater utilisation of wireless technologies could end up outweighing any economic benefits of 5G? If you decide to make a submission, please email through the contact form at this link http://www.stopsmartmeters.org.nz/contact-us/ to let Stop Smart Meters NZ know. A new NZ-based Facebook group has been set up for people in NZ who are electrosensitive. This is a closed group and is intended as a confidential forum in which people who have developed electrosensitivity can come together and support eachother. The details for the link are below. If you are electrosensitive and would like to join the group, please click on the JOIN button on the left hand side of the page and one of the moderators for the group will be in touch with you once you have answered some questions. Electrosensitive Community NZ on Facebook. Thank you for visiting the website of Stop Smart Meters NZ. If you are interested in smart meters or electromagnetic radiation and health, please sign up to our free email list at www.stopsmartmeters.org.nz. The select committee in charge of the bill the Econcomic Development, Science and Innovation (EDSI) committee began hearing verbal submissions on the bill on Thursday March 29. 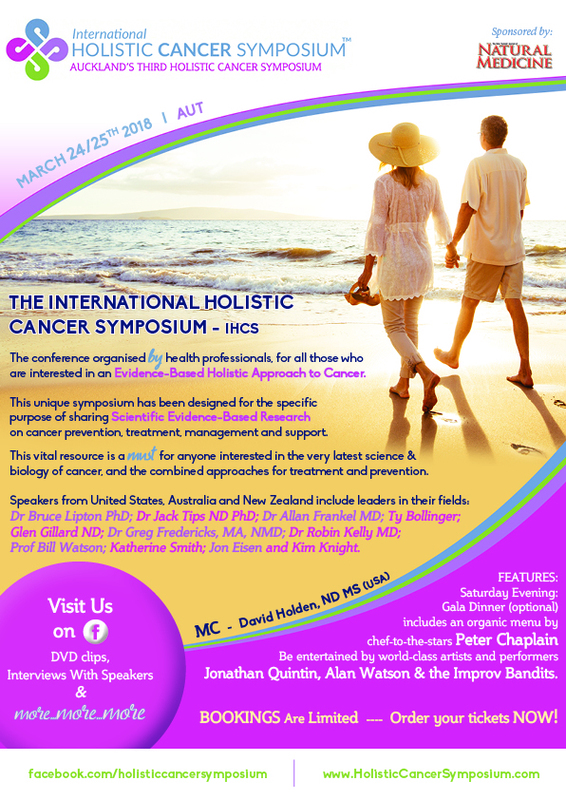 The International Holistic Cancer Symposium coming up in Auckland on March 24-25m 2018 includes presentations on many aspects of cancer prevention and treatment. 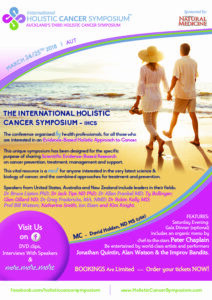 One of the presentations will be by Katherine Smith whose talk will focus on electromagnetic radiation (EMR) and health with special reference to cancer. Her presentation will also discuss ways to use modern technology more safely to reduce the risks of cancer (and other adverse health effects) associated with some products such as cell phones. Please share this link so that people who are interested learn about this event. Thank you. Interested in the smart meter issue or electromagnetic radiation and health issues? With the Economic Development, Science and Innovation Select Committee considering legislation* that could phase out the copper landline infrastructure, an article in C0mputer World from 2016 bears consideration. The link that shows that Spark plans to force people who are not considered to use “large” amounts of data from copper to wireless (and deprive these customers of a safe hardwired internet access option). The copper network allows people have a safe, wired low cost internet connection as well as a safe corded home phone that will work even in a power blackout. Wireless internet connections have the significant disadvantage that wireless modems and routers produce microwave radiation which is considered to be a possible human carcinogen (Class 2B). To learn how to make a submission to save NZ’s copper landline infrastructure, please click HERE. Making a submission can take as little as 5 minutes. We hope that you will support the new campaign to save copper landline phones infrastructure. If you are a Grey Power member, you have an extension to write a submissions on this issue until March 30 2018. please click HERE for details. Website editor’s note: The copper lines that are used for landline phones (and the safe hardwired internet access that these line also facilitate) are under threat in NZ. Please see this LINK for an introduction. if you would like to make a submission on the issue there is information on how to do this and where to send it that you can read by clicking http://www.stopsmartmeters.org.nz/latest-news/save-nzs-landline-phones-action-needed-now/. Below is a template submission that you can use. Please note that the text in bold italics is designed to edited out when you add your own details to personalise the submission. I oppose any change to telecommunications legislation or regulations that could make copper landline phones and/or internet access via the copper landline system unavailable to New Zealanders. The copper landline system is a proven and safe technology that is better for people’s health than wireless systems. * Is it important to you to keep access to a landline home phone in case of a medical emergency? * Do you have a friend or relative whose life was saved by being able to make a 111 call from their home phone? * Are you on a low income and could not afford to replace perfectly good corded home phones and install fibre optic cabling in your home in order to have a corded VOIP phone if the copper landline service were no longer available in your area? * Do you have children and want to ensure that you maintain access to a reliable copper landline service so that you can have a safe corded landline phone in your home for their use? * Are you a business owner who wants to help meet your obligations to workers to provide a safe working environment by having safe copper corded phones available for their use on your premises? The government needs to ensure that regulations are in place to protect access to copper landline phones in New Zealand and ensure that the infrastructure for this service remains well maintained and available at an affordable price. There should be a thirty year moratorium on the removal of copper landline infrastructure. Contractors installing fibre optic cabling in existing homes or buildings should be prohibited from removing internal copper phone wiring so that a dual system remains available for the use of the current (or future) house/building owner or tenant(s). Installation of the copper landline system should be mandated for new housing areas and new commercial and industrial developments. To reduce the burden of illness on individuals, families and taxpayers, the use of copper landline based corded phones and safe hard wired internet should be encouraged by the government to minimise the avoidable health risks from unnecessary use of cellular phones. Likewise, the government should encourage the use of hardwired computers for internet access. I would/would not (please delete one of these options depending upon your preference) like to speak to this submission. Include your name, address and contact details in the body of the email. If you are emailing your submission, please send an email through the Stop Smart Meters NZ contact form to let us know that you have sent a submission. Thank you for reading this post and for helping retain access to safe landline technology! Now, please help share this information with others. Thank you for visiting www.stopsmartmeters.org.nz! IMPORTANT UPDATE FROM WEBSITE EDITOR: If you are a Grey Power member there is still time to make a submission on this bill as members of this organisation have been given a extension until March 30. Please click HERE to learn more. It’s the number you dial in an emergency and for most New Zealanders it has been a reliable home phone that they have used if they have ever faced a medical emergency or needed to call the Fire Service or the police. Most New Zealanders cannot remember ever having lived without a basic home phone, thanks to the reliable copper-based infrastructure that has been installed all around New Zealand over the course of many, many decades. The “Telecommunications (New Regulatory Framework) Amendment Bill” could result in copper landline services being phased out in areas of New Zealand where fibre optic cables have been installed. If the bill is passed in its current form this bill it would deprive people of the basic home phone service and safe wired internet connection. Please take five minutes to make a submission. It is extremely important that as many people as possible express their opinions on the importance of maintaining landline phones. Open a new document on your computer, or get some writing paper. Start your document with your name, “Telecommunications (New Regulatory Framework) Amendment Bill”, and “I oppose any change to NZ’s telecommunications regulations that could mean that people who live in areas where fibre optic infrastructure has been installed would lose access to a safe and reliable copper cable based landline phone line and internet access service” or similar words to this effect. You can then write as little or as much as you want, sharing your views about why it is important for people to be able to have access to a copper phone line. If you would support 30 year moratorium on the removal of copper landline infrastructure, please state this, in your submission. NB: It is best to write a unique submission (even a short one) as a unique submission will carry more weight with the select committee. However, if you are really pressed for time there is a template submission that you can download and personalise from this LINK of the Stop Smart Meters NZ website. If you do use the template submission, please make it as individual as possible as that it does not appear to be a template submission. If you wish to appear before the Committee to speak to your submission, then state that also. (NB: Speaking before the committee is optional). If you’re emailing your submission, ATTACH your submission document (step 1) to the email, and in the email itself, put the heading: Telecommunications (New Regulatory Framework) Amendment Bill” and your details: Name of Individual / Family / Organisation, Address, Phone, Signature. Don’t put your personal details in the attached submission document as your submission is posted on the government website. If you are emailing your submission, please send an email through the Stop Smart Meters NZ contact form to let us know tat you have sent a submission. Post to: Matt Lamb, Committee Secretariat, Economic Development, Science and Innovation Committee, Parliament Buildings, Wellington 6160. Thank you in advance for making a submission! The closing date for submissions was February 2 but Grey Power members have an extension until March 30. Please click HERE for details. NB: If you are on Facebook, please consider “liking” and “following” the following page so that you can get updates on the landline phone issue.